Today at a special event in NYC, LG unveiled the LG G4. We’ve had some time with the latest and greatest from LG and felt it was only appropriate to pit it against one of its biggest rivals, Samsung. 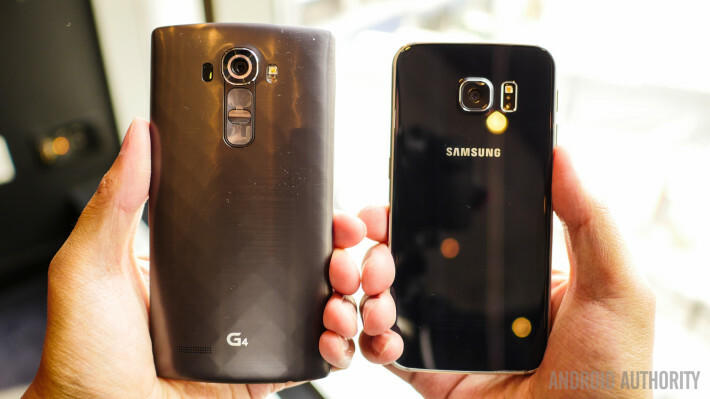 Without further ado, the two Korean giants go head to head as we pit the unique iteration of Samsung’s flagship against LG’s latest and greatest offering in the Android world in this quick look at the LG G4 vs Samsung Galaxy S6 Edge! The LG G4 combines the best design features of its previous flagship offerings, with the device sporting a curved display, albeit a more subtle iteration compared to the significant curve of the G Flex 2, while retaining the most recognizable aspect of an LG smartphone, the rear button layout within easy reach of the index finger. Samsung’s latest flagship offerings brought with them a major upheaval to the build material and quality with its metal and glass construction, while the more unique Galaxy S6 Edge boasts two curved edges that not only enhances the look, but serves a purpose as well, mainly in ergonomics. There’s no mistaking it for anything but a Samsung device though, with signature elements like the physical home button up front and standard placements for the volume rocker and power button available. With the new design language and build quality of the Galaxy S6 and S6 Edge comes some compromises as well, with the glass and metal unibody design resulting in the lack of features such as a replaceable battery and microSD expansion. That isn’t the case with the LG G4 though, with the flagship being one of the few to still have these options available, accessible via the removable back cover. 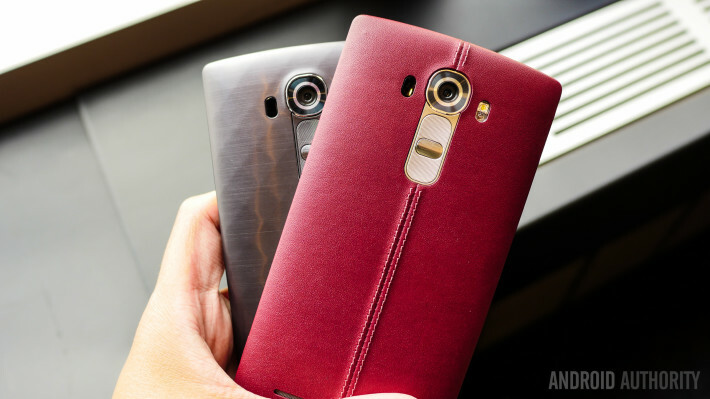 Speaking of back covers, the LG G4 brings a slew of options to the table. Prominently featured in the leaks and teasers released by LG is the leather material with the stitching down the center, which will be available in a variety of color options, with more to be released over the summer. For those looking for something more standard, plastic is an option as well with the black version, seen in this comparison, coming with a titanium finish, along with white and gold iterations that feature a ceramic finish. While the Samsung and LG flagships remain familiar, both companies have now moved far beyond the cheap-feeling glossy plastic that has been seen with some of its predecessors. Both devices now offer the premium look and feel that is expected from devices that command the kind of price points these do. Samsung’s well known display prowess continues with the 5.1-inch Super AMOLED display of the S6 Edge, with the resolution bumped to the current flagship standard of Quad HD. Super AMOLED brings with it the deep blacks and vivid colors that we all love, and brightness and viewing angles are fantastic. The two edges add to the overall effect as well, adding a few extra features to the table. The G4 on the other hand is packing a 5.5-inch IPS LCD display with a Quad HD resolution, enhanced to what LG is calling a Quantum display, so named because of the RGB coloration achieved by passing the colors through a specific phosphor layer. A big focus was also on making this display rival the DCI standard found in general television and cinema. Whereas the Super AMOLED display might oversaturate colors a bit past the DCI standard, the LG G4 Quantum display hits 98% of the mark. It is worth mentioning here that despite the G4 coming with a curved display, the more significant curve of the G Flex 2 allows for an immersive effect that isn’t available here, and this somewhat defeats the purpose of having a curved display in the first place. That said, the LG G4’s slight curve does bring with it some of the durability found on the Flex line. Turning to performance, the G4 packs a Qualcomm Snapdragon 808 processor, created and optimized specifically for the LG flagship in partnership with Qualcomm. Along with 3 GB of RAM to help with multi-tasking, the performance of the G4 as smooth as expected, and in our short time with it there were no noticeable hiccups. Samsung, on the other hand, decided to skip the Snapdragons of the world in favor of its in-house Exynos 7420 processor, also backed by 3 GB of RAM. Being able to optimize the software experience with their own processing package is the standout here, and the issues with stutters and lag that Samsung has received a lot of flak for in the past are nowhere to be seen. With both phones we are probably going to see a fairly close race when it comes to performance, and we are looking forward to seeing whether or not the LG G4’s Snapdragon 808 can keep up with Samsung’s latest chipset. Hardware takes on a very different look here, as the LG G4 is one of the few Android flagships this year to offer a removable back with both a replaceable battery and microSD slot — features Samsung used to put in every phone. With the Samsung Galaxy S6 and S6 Edge’s unibody construction you no longer get a removable back, battery, or microSD card, while the LG G4 offers these features as standard on both the plastic and leather variants. The Galaxy S6 Edge comes with a 2,600 mAh non-removable battery that proved to provide a battery life that is just about average. The G4 comes with a larger 3,000 mAh unit, but how much difference that makes will have to be seen. Of course, you do have the option of carrying spare batteries around with the G4. Both devices also come with fast charging capabilities. Turning to storage, you’ll find 32GB on the LG G4, with a microSD slot for expansion. In contrast, the Samsung flagship can be found in 32GB, 64GB, and 128GB flavors. A standard suite of connectivity options are available with both handsets, but the close relationship with Qualcomm has also meant an enhancement in GPS in the case of the G4, with LG claiming that the device will be more accurate than any other phone by using nearly every sensor available to achieve location tracking. Samsung always manages to pack something extra though, and that comes in the form of a fingerprint scanner integrated into the home button up front and in a far better implementation this time around, as well as a heart rate monitor, placed next to the camera module on the back. Neither of these features can be found on the LG G4, though many users probably won’t mind the omission. In the case of the G4, a f/1.8 aperture package outshines the competition with a larger sensor than many of the others found in flagships. OIS is also enhanced with a wider stabilization range. Color has been given a big focus, with LG adding in a color spectrum sensor found right next to the optics that will analyze the scene to help achieve the right white balance automatically and accurately. The manual mode is another big story, as LG has put in all of the big features photographers get in full cameras – a full white balance gamut, a lot of ISO stops, manual focus, a histogram, and even the ability to shoot RAW and JPEG simultaneously, which would definitely require the expanded storage option. Overall, the camera package looks great, and we can’t wait to put it through its paces. Of course, the Galaxy S6 Edge features a camera package that is definitely among the best. A rear-facing 16 MP camera with a f/1.9 aperture adds auto-HDR to a laundry list of capabilities, with the front-facing 5 MP unit sporting the same as well. We’ve already explored the camera experience on the Galaxy S6 Edge in detail, and it can’t be stated enough how good it is. We’ll be putting both cameras through their paces in a detailed shootout once our review unit of the LG G4 arrives, so stay tuned for that. In software, the G4 comes with a very familiar user interface that hasn’t changed much in looks, but an optimized processing package allows for lag and stutter to be kept at a minimum. Additions include an enhanced calendar that can save captures from most parts of the phone as reminders on dates and a more powerful gallery application that, among other uses, groups photos into Memories categories for an easy way to look back on it. The software experience on the Galaxy S6 Edge is also one of its plus points, something that we never thought would be said for a Samsung device. While the general aesthetic is familiar, the large number of gimmicky features have been cut down significantly, and those that are available aren’t in your face all the time anymore. A theme engine also lets you completely change the look and feel of the UI to better suit your tastes. With the edges comes some additional features, like nightclock, a news ticker, the ability to see notifications, People Edge, and edge lighting. These features may or may not be particularly useful though, but do stay on the sidelines if you don’t want to use them. So there you have it – a quick look at the LG G4 vs Samsung Galaxy S6 Edge! Both devices certainly have some big differences, however, we will say that both Korean giants seem to be pretty neck and neck this time around, and we looking forward to fully pitting the two flagships against one another in an even more detailed versus in the weeks to come.